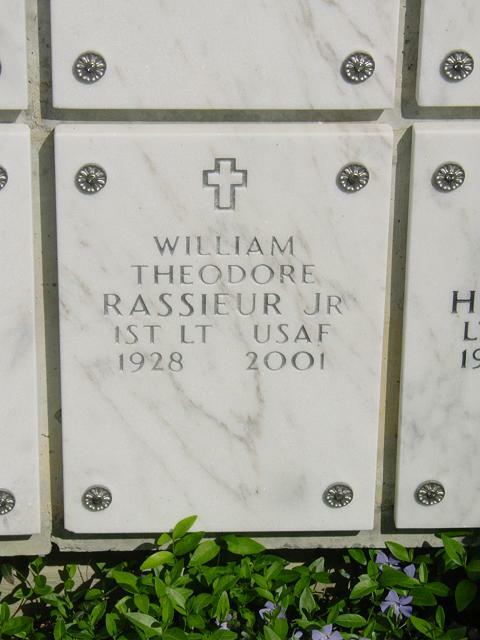 William T. Rassieur, Jr. died on 10 October 2001. He is survived by his sweetheart and wife of 50 years, Joy Rassieur, of Dripping Springs. He also leaves daughters, Gayle Harris of Austin and Donna Abelson of Los Gatos, California, and two sons-in-law, Daniel Harris and David Abelson; four beloved granddaughters; and innumerable friends far and wide. He will be deeply missed by everyone who was fortunate enough to know him. Bill was born in San Diego, California, on April 28, 1928. He was a top scholar and 1950 graduate of the Naval Academy at Annapolis and served our country in the United States Air Force during the Korean War, earning the Korean Service Medal, the National Defense Medal, and the Air Medal. He subsequently entered a distinguished career as an engineer and program manager with Lockheed Missiles and Space Corporation, and later enjoyed his retirement years perfecting his golf game, firing up the grill, and proudly watching over his family. Dad, you never let us down and you'll always be our hero. The family would like to thank the staff at South Austin Hospital, the ICU nurses, and Drs. Blancarte, Utts, Fass, and Boysen for their efforts and compassion during this difficult time. Private services at Arlington National Cemetery are pending. Captain Rassieur was the son of William Theodore Rassieur, Rear Admiral, United States Navy.